Things have been busy (but lovely) here the past week with visits from family and friends. We have done lots of eating, cooking, talking, swimming and sitting around fires – it has been really lovely. I will post some photos and recipes in the next few days. Just for now, this was a delicious salad I made for lunch last week. 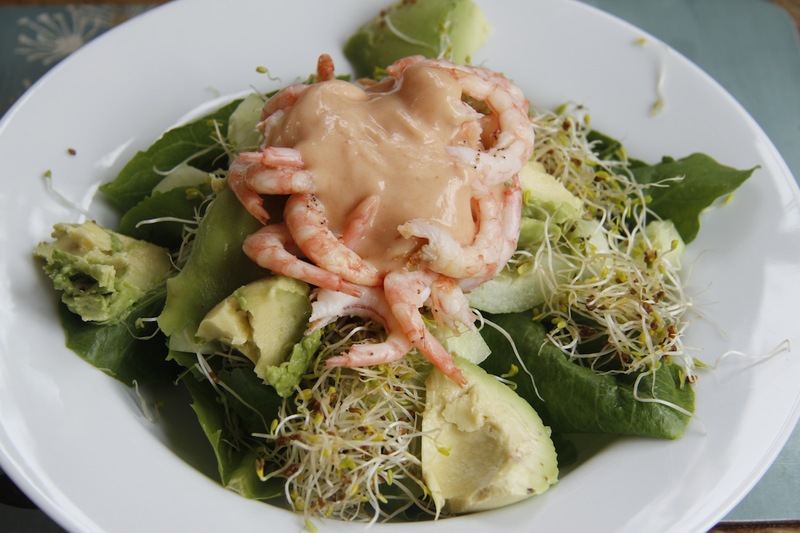 Smoked prawns from Pinney’s on a bed of lettuce and cucumber from the garden, some alfalfa spouts and avocado – with a home-made marie-rose style dressing (mayonnaise, lemon juice and a squeeze of tomato puree. I love summer!